I spent more time trying to adequately name this sauce than actually making it. 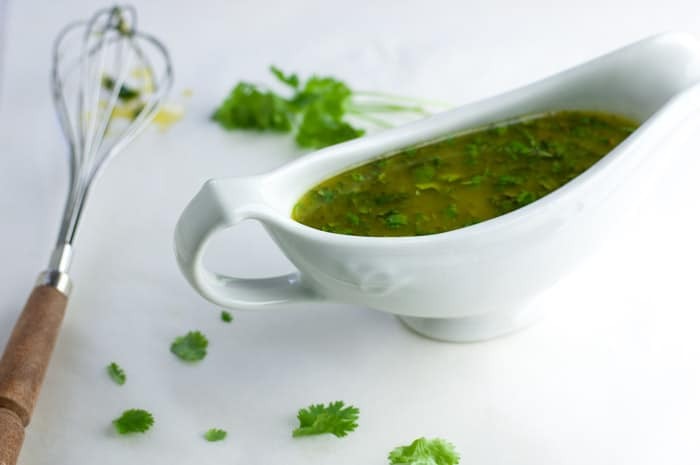 This Honey Lime Cilantro Sauce could be called Fix Your Food Sauce because it’s bound to help anything you pour it over (chicken, steak, pork, fish). 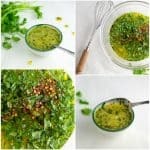 It could also be called Honey Lime Vinaigrette because it’s got a smidge of vinegar and this cilantro sauce and a salad could have a torrid love affair. But ohhh poured over some thick juicy pork chops and, as you’re eating it, it soaks into the rice mmm nom nom nom…sorry. Do you really need me to drill it into your head on how good this is? Maybe pictures will do the job. I wanted to face plant myself right into the plate. 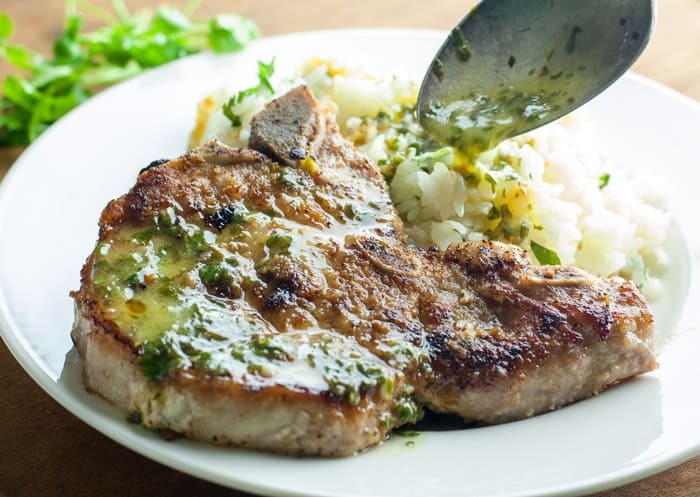 If you want to face plant yourself into your own pork chop and rice that’s been smothered in this sauce, the recipes are here and here. This is sauce is so flavorful, you could skip the fancy rice I mentioned. Just pour over plain rice! 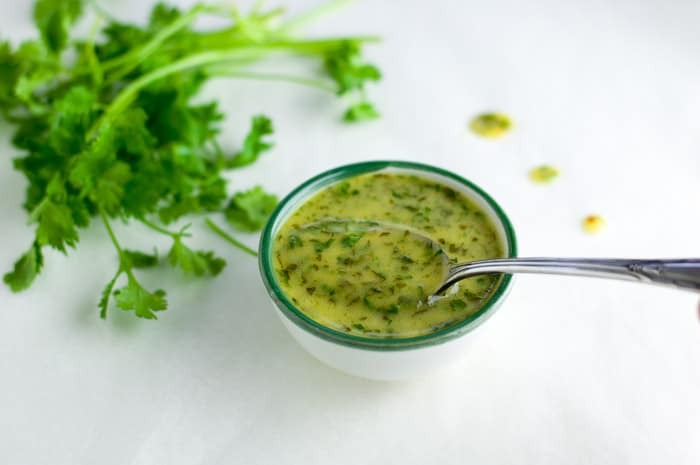 The cilantro sauce is tangy, sweet, and slightly spicy. I tried it two ways: Mixed together in a food processor (pic above) and whisked together in a bowl (see how it looks below in the gravy boat below). Both were equally as good. 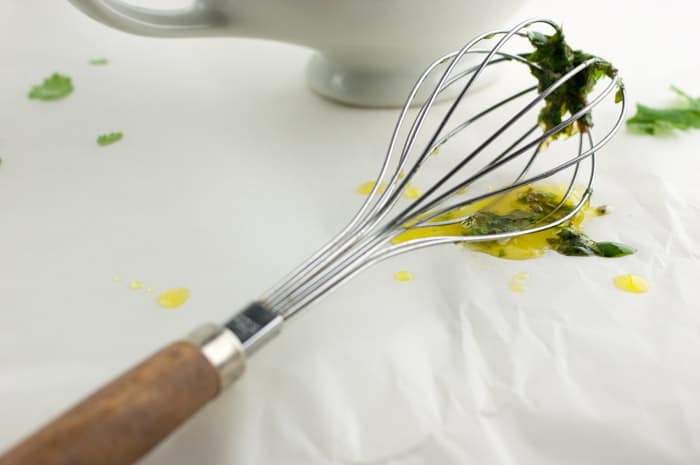 If you only whisk it, the ingredients do settle a bit at the bottom, but nothing that a quick stir can’t fix. 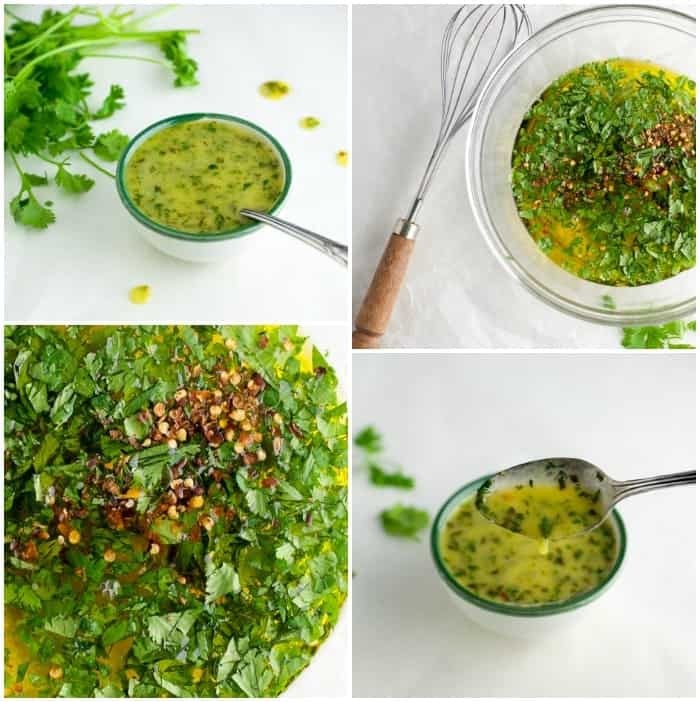 This Honey Lime Cilantro Sauce will be making an encore in my kitchen soon. 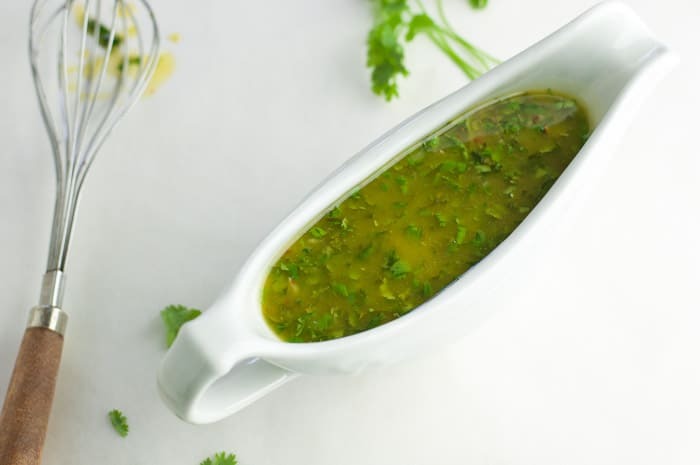 It only takes 5 minutes and it doesn’t need to marinate or cook on the stove. Yay! More time to face plant yourself into a plate of something good. In a small bowl, mix all ingredients together with a whisk or process all ingredients together in a food processor. 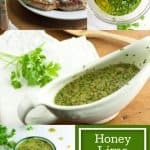 Can u use a honey lime vinaigrette as a shrimp marinade? I don’t see why not. It sounds delicious! Hi, Hector. While I don’t want to stop anyone from being adventurous and trying something out of the ordinary, no, I don’t think this would go well on any dessert. Yes, there is a tiny bit of sweetness to this sauce, but it’s more of a savory thing. With the garlic, vinegar, cilantro, red peppers…it doesn’t sound like it would be good on top of dessert to me. 🙂 But if you do end up trying it, I’d love to hear the results! I’m very pleased to discover this web site. I want to to thank you for ones time for this particularly fantastic read!! as a favorite to check out new information in your site. Big fan of this dressing. I made it to go on my spaghetti squash with meatballs. taste like a dream. Hi, Megan. I’m so glad to hear you liked it! Would have never thought to put it on spaghetti squash. Yum! a blog every once in a while that isn’t the same out of date rehashed information. Great read!